Global Think-ins are vehicles for generating new ideas and perspectives on issues of global concern. The Think-ins are designed as forums for academics and practitioners from diverse disciplinary and methodological backgrounds, geographical locations, and expertise to share, critique, and develop new ideas. 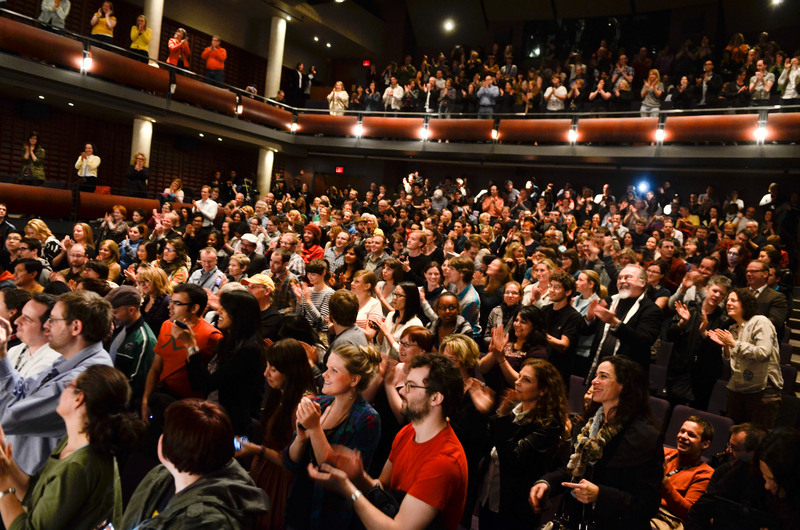 Global Think-ins take the form of small brainstorming sessions paired with large public events, and the format includes both on site and online exchange with participants in other places. Think-ins relating to CGT research projects are also held at Columbia Global Centers, which add perspective and insights from different parts of the world. Be sure to learn more about our upcoming and past Global Think-ins below. 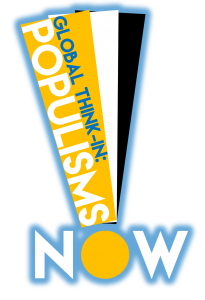 Oct. 31, 2016 at Columbia University School of Journalism, Pulitzer Lecture Hall – Populisms Now addressed the surge of populism in so many places at the same time. The point may seem obvious, yet so much contemporary analysis remains one-country focused. Watch the video. Apr. 25, 2016 at Columbia University, Buell Hall (Maison Française), East Gallery – Money is both one of the great intellectual puzzles and practical problems of the modern world. And yet, at moments of crisis, we discover and rediscover the disconcerting fact that purchasing power in the most important currencies of the world is in fact generated in oceanic quantities beyond the boundaries of the states to which it belongs, by actors that are not the state. 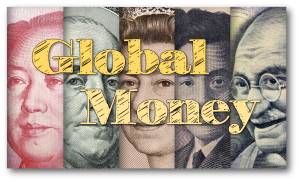 “Global Money,” led by CGT members Perry Mehrling and Adam Tooze, addressed past, present, and future of the global monetary system. Watch the video. Perry G. Mehrling, Professor of Economics, Barnard College; Member of the Committee on Global Thought, Columbia University. Adam Tooze, Kathryn and Shelby Cullom Davis Professor of History; Director of the European Institute; Member of the Committee on Global Thought, Columbia University. Patricia C. Mosser, Senior Research Scholar, Faculty of International and Public Affairs, Columbia University. Phil Prince, Managing Director and Head of Treasury, Pine River Capital Management. Katharina Pistor (moderator), Michael I. Sovern Professor of Law, Director of the Center on Global Legal Transformation, Columbia University. Welcome remarks by Vishakha N. Desai, Senior Advisor for Global Affairs to the President; Senior Research Scholar, School of International and Public Affairs; Member of the Committee on Global Thought, Columbia University. Dec. 9. 2015 at Columbia Law School, Jerome Greene Hall, Room 104 – Exploiting our boundless desire to access everything all the time, digital technology is breaking down whatever boundaries still exist between the state, the market, and the private realm. 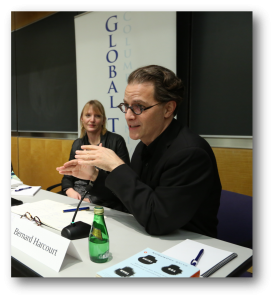 Global Exposure, led by Professor Bernard Harcourt, offered a powerful critique of our new virtual transparence, revealing just how unfree we are becoming and how little we seem to care. Watch the video. Betsy Reed, Editor-in-Chief of The Intercept. Clive Thompson, writer for the New York Times Magazine; columnist for Wired. Judith McHale (moderator), President and CEO of Cane Investments, LLC; former Under Secretary of State for Public Diplomacy and Public Affairs. Welcome remarks by David K. Park, Dean of Strategic Initiatives for the Arts & Sciences; Member of the Committee on Global Thought, Columbia University. 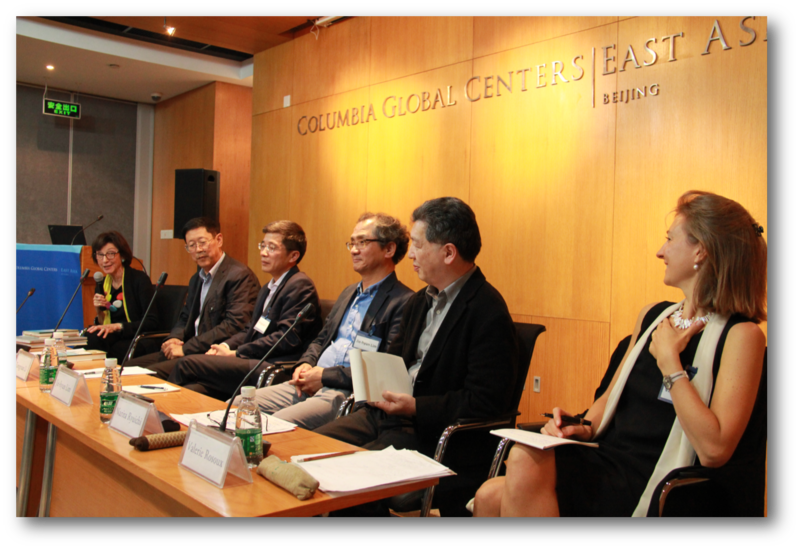 Oct. 15, 2015 at Columbia Global Centers | East Asia, Beijing with Narita Ryuichi, Charles K. Armstrong, Bu Ping, Li Zonguan, Jie-hyun Lim, Valerie Rosoux, and Carol Gluck. Part of the “Politics of Memory in Global Context” Signature Research Project. Read more about the event. Narita Ryuichi, Japan Women’s University, on Japan. Charles K. Armstrong, Columbia University, on Korea. Bu Ping, Chinese Academy of Social Science, on China. Li Zonguan, Museum of the War of Chinese People’s Resistance against Japanese Aggression, on China. Jie-hyun Lim, Sogang University, on Poland. Valerie Rosoux, Louvain University, on the EU. Carol Gluck (moderator), Columbia University. Apr. 23, 2015 at Columbia University, Buell Hall (Maison Française), East Gallery – Evidence-Based Medicine: How Sound is the Evidence, led by Professors David Madigan and John Ioannidis, addressed how randomized clinical trials provide the highest quality of evidence with regard to the efficacy and safety of medical interventions such as drugs and surgical procedures. Watch the video. David Madigan, Professor of Statistics, EVP and Dean of the Faculty of Arts and Sciences, Columbia University. John Ioannidis, C.F. Rehnborg Professor in Disease Prevention in the School of Medicine and Professor of Health Research Policy, Stanford University. Wafaa El-Sadr, University Professor, Epidemiology and Medicine, and Director, International Center for AIDS Care and Treatment Programs (ICAP) and Global Health Initiative, Mailman School of Public Health, Columbia University. Steve Lohr, Technology reporter for the New York Times, and author of Data-ism (Harper Business, 2015). Apr. 16, 2015 at Boğaziçi University, Istanbul with Rashid Khalidi (historian, on 20th century Middle East), Leyla Neyzi (anthropologist, on the Armenian genocide,) Minoru Iwasaki (philosophy on the 1923 massacre of Koreans), moderated by Edhem Eldem (historian). Part of the “Politics of Memory in Global Context” Signature Research Project. Read more about the event. Rashid Khalidi, history, Columbia University, 20th-century Middle East. Leyla Neyzi, anthropology, Sabancı University, 1915 in memory. Murat Paker, psychotherapy, Bilgi University, Trauma of 1915. Minoru Iwasaki, philosophy, Tokyo University of Foreign Studies, 1923 massacre of Koreans in Japan. Moderated by Edhem Eldem, history, Boğaziçi University. 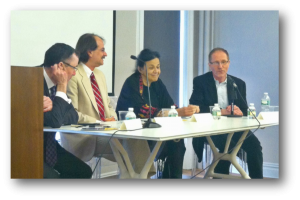 Jan. 8, 2015 at Columbia Global Centers | Europe, Paris with Olivier Klein (psychologist), Armelle Viard (neuroscientist), William Hirst (psychologist), Richard Rechtman (anthropologist), Denis Peschanski (historian), Brigitte Sion (museums and memorials), moderated by Denis Peschanski. Part of the “Politics of Memory in Global Context” Signature Research Project. Read more about the event. William Hirst, Professor of Psychology, The New School. Olivier Klein, Professor of Psychology, Université Libre de Bruxelles, Belgium. Sarah Gensburger, Sociologist, National Center for Scientific Research, Paris, and curator. Richard Rechtman, Psychiatrist and anthropologist, Ecole des Hautes Etudes en Sciences Sociales, Paris. Carol Gluck, Professor of History and East Asian Language and Cultures, Columbia University. Moderated by Brigitte Sion, Columbia University. 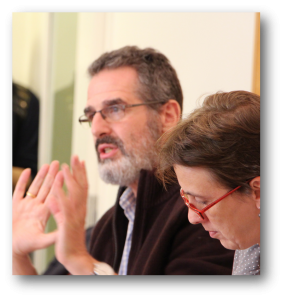 Oct. 8, 2014 at the Columbia University, Heyman Center for the Humanities, Common Room – Global Governance, led by CGT member Mark Mazower, addressed the past, present, and future of attempts to “govern the world” from a variety of perspectives and at a number of scales. Watch the video. Mark Mazower, Ira D. Wallach Professor of History and CGT Member. Partha Chatterjee, Professor of Anthropology and of Middle Eastern, South Asian, and African Studies and CGT Member. Moderated by Katharina Pistor, Michael I. Sovern Professor of Law, Columbia Law School. Welcome remarks by Saskia Sassen, Robert S. Lynd Professor of Sociology and CGT Member.